Not sure how to prepare your bird? 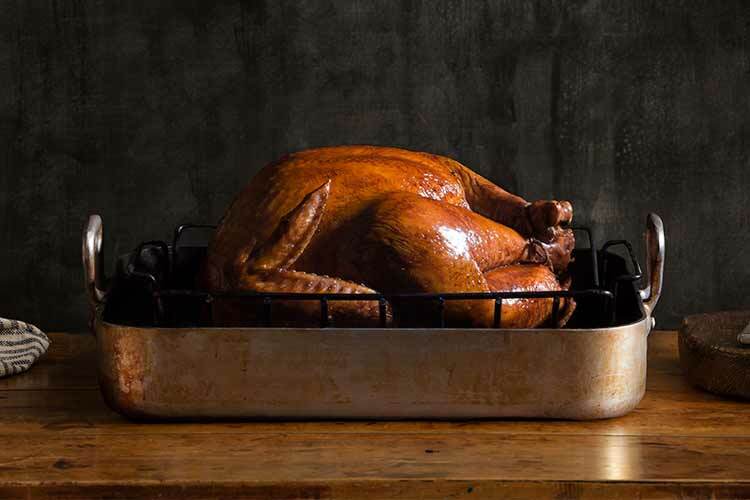 No problem—our recipe for roasting the perfect turkey ensures crisp, golden skin and tender, juicy meat. Our customers and staff alike swear by it! For help rounding out your Thanksgiving spread, we’ve got lots of options available on our Thanksgiving Menu of ready-to-eat prepared foods, all of which are made in-house. If you’re cooking or entertaining for the holiday, be sure to stock up on Thanksgiving essentials. Our current specials include great deals on all kinds of kitchen staples and indulgent treats. And if you need any last-minute groceries, we’ll be open on Thanksgiving Day from 7AM until 4PM at all five Union Market locations. Happy Thanksgiving from all of us at Union Market! Free-roaming, humanely raised, fresh, uncooked turkeys from Plainville Farms in Pennsylvania. Raised on family farms on an all-vegetarian diet without the use of antibiotics. Our free-roaming, humanely raised fresh turkeys from Plainville Farms are also available brined and oven-ready—all you have to do is stuff, truss, and roast them. The DiPaola family’s fresh, flavorful turkey has long been a favorite in local farmer’s markets for good reason. We’re delighted to offer their whole, uncooked turkeys for Thanksgiving this year. Raised on a vegetarian diet without any antibiotics or added hormones. Certified organic fresh, uncooked turkeys from Hidden Camp Farms in New York State. These pasture-raised turkeys roam where nature intended: on green, grassy pastures out in clean air and sunshine. No antibiotics, added hormones, or GMOs are ever used. You can place your turkey order by phone or in person at your nearest Union Market. Orders must be placed by Friday, November 16, 2018. Please place your order at the store location where you wish to pick up, and please note that supplies of turkeys in specific weight ranges are limited. Credit card information is required to place an order, and orders not picked up are subject to a 50% cancellation fee.